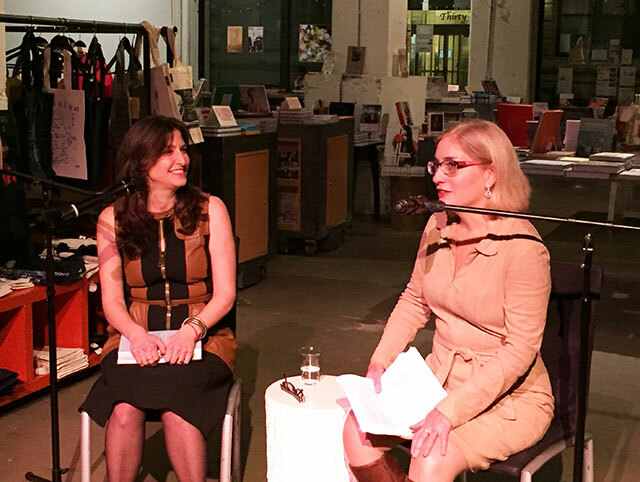 Sharon Guskin launched her debut novel The Forgetting Time at Powerhouse Arena in Brooklyn. She was joined for conversation by Liesl Schillinger, a journalist and critic. The Forgetting Time is the story of a single mother raising a child who has disturbing dreams — dreams so vivid they feel like authentic memories of a past life. Guskin says she had always been somewhat curious about the elements in the book. When she was younger, she volunteered in Thailand. The children she helped told her when she left that they would see her in the next life. It was an idea that stuck. She says she felt there was more to our perception of things and that she was curious to find out more. She read about Ian Stevenson and the Division of Perceptual Studies where he studied children who had the dreams of past lives. There have been more than 3,000 children who identified these past memories. She read about famous cases like Shanti Devi, a child who claimed she had the memories of a past life. Even Mahatma Gandhi believed enough to set up a commission to investigate her claims. “These cases obviously consumed me,” Guskin explains. As a mother herself, she couldn’t help but wonder what it would be like to raise a child who had these dreams, who believed they had another mother. In the United States, people don’t often follow up on these claims. But once she started researching these ideas, she often found many people and many instances with similar stories. Through her research, Guskin says she finds it extremely difficult to imagine a different explanation for these cases. “As novelist, it’s my job to ask questions,” she says. The novel took her six and a half years to write. There are two other manuscripts that have never made it out into the world. She felt very certain she would sell the second book, and when she didn’t, she attended a writing community where she met an author who had five books that hadn’t sold. “This book only exists in its form because of so many people,” she says.